Lettres d’un Cultivateur Americain, Ecrites A. S. Ecuyer, Depuis l’Annee 1770, jusqua 1781. Paris: Chez Ciuchet, Libraire, rue & hotel Serpente, 1784. First French Edition of this important seven-year account of Colonial era American life, an expanded edition of the First American Edition of 1782. Very popular in Europe, the book saw the printing of eight editions in five years after its initial introduction and is considered among the first in the canon of American literature. Born in Caen, Normandy, Crevecoeur studied in Jesuit schools and served four years as an officer and mapmaker in Canada before settling in America in 1759. He became a New York citizen in 1765 and in 1769 married Mehitable Tippet, a Loyalist. Split loyalties among family and neighbors caused friction and he spent months in a British army prison in New York City before sailing for Europe in 1780. In 1782 he arranged for the publication of his twelve essays called Letters from an American Farmer. Crevecoeur’s accounts were descriptive of life in the Colonies, ranging from farm life to the “Nantucket sequences” that describes aspects of Quaker life on Nantucket and Martha’s Vineyard. 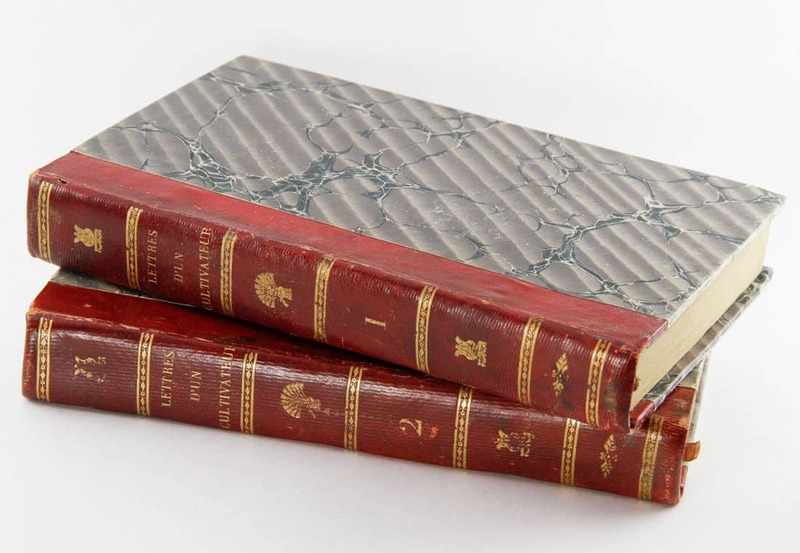 A near fine two-volume set in contemporary half-leather and marbled covers with some minor browning and water staining to the preliminaries, but otherwise clean and presentable. Errata sheets precede text in both volumes. Overall a near fine set of this landmark work.